CASE Construction Equipment has made available a free CASE Experience AR App, which uses Augmented Reality (AR) technology so customers can engage with its products through interactive and 3-D features, videos, animations and voice-supported text. AR technology is the process of superimposing digitally rendered images onto real-world surroundings, giving a sense of an illusion or virtual reality. The use of the technology is rising with the popularity of smartphones and tablets and AR applications can be found in industries raging from the medical field to the military, the company said. 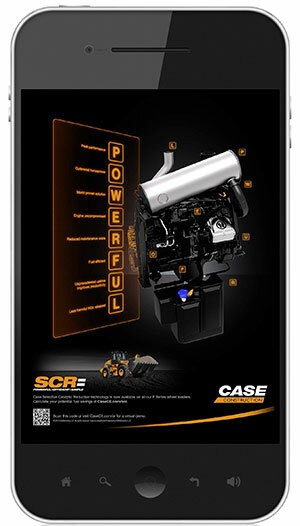 The CASE Experience AR App currently is available on print advertisements for the company’s selective catalytic reduction (SCR) technology available on the F-Series wheel loaders. Using the application, customers can see how SCR works to deliver a 12 percent increase in fuel efficiency along with faster acceleration, quicker cycle times and less downtime. “The CASE Experience AR App demonstrates the power and simplicity of SCR technology for generating peak, fuel efficient engine performance while converting NOx to harmless nitrogen and H2O emissions,” Campos said. Pointing the tablet or phone camera at one of the two AR ads with the black and white QR code at the bottom brings up a 3-D, interactive view of how SCR technology works. Touching the separate markers or images on the device screen launches several voiceovers that explain why SCR is better for customers’ operations and the environment. Touching the CASE logo at the bottom of the screen lets users sign up for more information or request a product demonstration. 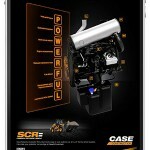 The app is available for download from casece.com/ar, Google Play for Android devices, and Apple iTunes for the iPhone and iPad. The augmented reality print ads can be viewed on the CASE Construction Equipment website and in several construction industry magazines.